﻿Epiphany: Calendar, History, Tweets, Facts, Quotes & Activities. Epiphany Day is a Christian holiday that marks the day that the Three Kings visited Jesus, having followed a star to reach him. They followed a bright star that foretold the birth of a new king, and brought gifts of gold, frankincense and myrrh (Matthew 2:1-3, 7-12). This holiday is celebrated in Western Roman Catholic and Protestant churches. It is also known as the 12th Day of Christmas, as it falls twelve days after Christmas Day. 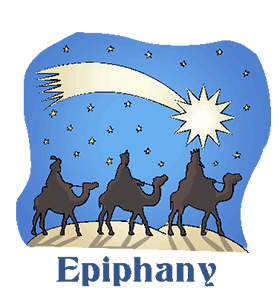 Epiphany is the last day in the Christian season of Christmas. In Western churches, it is observed on January 6, hover some churches celebrate day on the Sunday after January 6. Epiphany Day is celebrated as a public holiday in Sweden, Finland and Iceland. Denmark and Norway do not have the day off, but do hold special mass and church services. The day is also a holiday throughout much of Eastern Europe. Frankincense, a perfume, and myrrh, anointing oil, were traditional gifts for kings during the time of Christ. Bodies were also prepared for burial with these items. These were the gifts that the wise men brought to the baby Jesus. In Latin American culture, Epiphany, which means 'manifestation', is celebrated with plays and special songs that celebrate the coming of the three kings, or magi. Children place boxes of hay under their beds for the magi' camels, and in return they receive gifts. In some Eastern Orthodox Christian communities, Epiphany is celebrated by a procession to the nearest river, lake, or pond. The priest blesses the water and he throws a cross in the waves. People dive into the water to retrieve the cross, and the one who finds it is thought to be particularly blessed in the New Year. Take down any decorations, you should have taken these down on Knut’s Day, the day before Epiphany, but if you’ve been too busy eating, today is the day to get them down. Sing We Three Kings , a traditional Epiphany hymn telling the story of the magi. Go to an Orthodox service and witness a Epiphany procession. This often includes pageantry of colourful robes and a large bowl of water centered in the middle of the church. Churches are often decorated with flowers and greenery. In some Western churches, church members share king cake, similar to the pastry served on Mardi Gras in New Orleans. A coin or bean is cooked into the cake, and whoever receives them gets to wear a crown for a day. 1) Fanny and Alexander (1982), this film depicts a family in Uppsala, Sweden during the 1900s and is a national favourite. biblicalarchaeology.org on Why Did the Magi Bring Gold, Frankincense and Myrrh?